For the last 2 years I've made my living shooting architecture with DSLRs, mostly short videos of California's fanciest multifamily apartment communities. When my client Synergy Corporate Housing asked me to continue that mission with all of their international properties in 10 major cities across 8 European countries, the first thing I thought when I saw the 32-day itinerary was, "bring a Hasselblad." Thing is, I knew nothing about shooting film. Zero. Let alone about shooting 120 film (what most medium-format film is called because it is comes on a roll of 12 frames, or maybe because it's in 6cm x 6cm square frames, who knows). So I went to one of my local rental houses, Keeble & Schuchat in Palo Alto, CA and rented a Hasselblad 503cw, an 80mm f/2.8 (full frame 50mm equivalent), and bought 5 rolls of 120 film. They explained to me that a medium format film camera system is 3 parts: lens, body, back. In this post I'm going to take you on my trip with me from Paris to Tel Aviv and show you the few things this DSLR shooter learned about shooting medium format film. I'll show you metering test shots from my Nikon D800, the corresponding film scan from the 503cw, what important lessons I learned about this iconic camera system from each shot, and why I bought one when I got back. None of the film has been retouched or digitally processed in any way. 1996 Hasselblad 503cw, an 80mm f/2.8 lens and a roll of 120 film. In medium format film, your ISO is a fixed measurement of the sensitivity of your roll of film. For at least 12 shots at a time you can't change it. 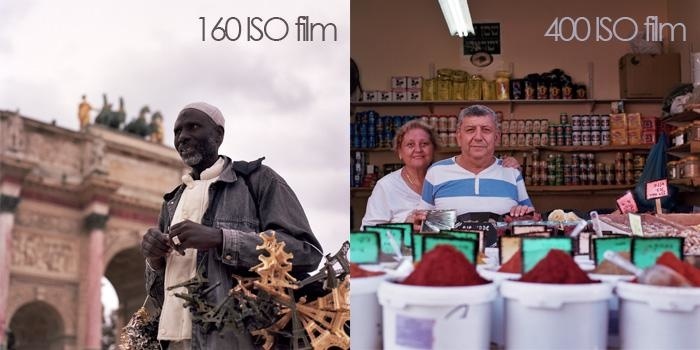 160 speed film is the same as your DSLR being set to ISO 160 and is best for outdoors. 400 and 800 speed are common for indoors. 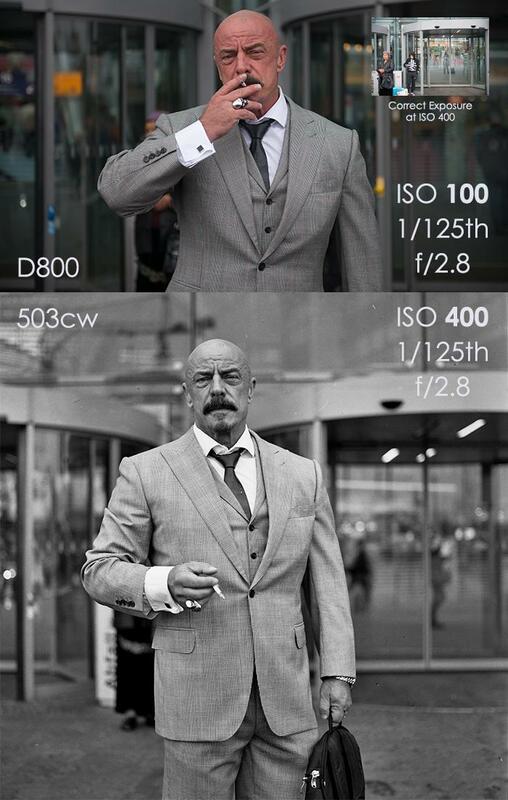 This is critical to understand for metering your shots and knowing your roll’s limitations. Medium format film camera systems have no metering system. Gasp. You're shooting in full manual and what you see through the waist level viewfinder is not necessarily what you're going to get. Most professionals handle this by using a light meter, but to start I recommend taking your DSLR with you too. Bringing your DSLR with you when you shoot medium format film not only offers you an accurate light meter, but shows your subject's focus distance, a rough composition and a test exposure too. Set your DSLR to the ISO of the film you have loaded and apply your shutter speed and aperture settings from your DSLR to your medium format lens (that's where all the settings hang out) and fire away. There is no white balance setting, it’s in the film. And if you’d rather only carry one camera at a time but don’t have a Sekonic light meter, there are a ton of accurate enough light meter apps for your smartphones. For 99% of people, a medium format telephoto zoom lens isn't in the budget, and there sure aren't many made for this camera system. You'll most likely be using an 80mm f/2.8 lens, the flagship kit lens for this camera and the equivalent of a 50mm full frame lens. So if you can, leave your DSLR telephoto zoom behind. No sense in carrying around all that weight. Instead, bring an equivalent focal length manual focus lens for your DSLR if you have one. It will give you an accurate focus distance reading with hard stops on the outside of the lens, much like the Hasselblad's, and it will teach you that you don't always need to shoot wide open (especially since the shortest exposure is only 1/500). I often chose my Nikkor 50mm Ai-s lens. Because I'm so used to my 24-70mm workhorse though, I found myself having to run around a lot more with this prime lens to get the shots I had in my head, especially ones of big monuments I'd normally shoot closer to 24mm. On this camera system, the shortest exposure is 1/500, the longest exposure is 1 second, and your ISO is fixed (and its low). This means camera shake and vibration plays a significant role in more of your shots on medium format film than on your DSLR, especially when it gets dark. If you have 160 speed film loaded from sunny lunchtime and you want to take a shot inside after dinner, it's literally impossible without a tripod, and even then you only have 1 second max to collect enough light to capture what your DSLR has no trouble with at ISO 3200+. Don't believe me? Go outside after dark tonight and try to take a nice handheld exposure of your street at ISO 160. This is the point I started seeing what folks meant when they suggest that this camera system makes you think a lot more and teaches you multiple ways to expose the same image. To help illustrate this tripod point in DSLR terms, here's a situation I found myself in in Paris. 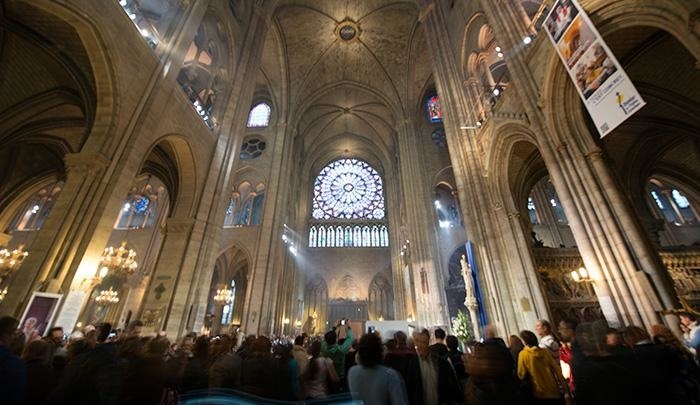 I’m in Notre Dame Cathedral on Sunday evening during mass. This room is absolutely epic when you look up, but it’s crawling with people. There’s no way I can get my sticks down so I have to shoot handheld. Here is a test shot from my D800 to see if I'd be able to shoot handheld on the Hasselblad during the tourist madness and still get sharp detail in the architecture. The short answer is it wasn't going to happen. I couldn’t shoot handheld in this dark room with the Hasselblad and get a sharp image. So instead I cranked my D800 up to ISO 2500 and took this handheld instead. I'd rather take this shot on a tripod and stop down with either camera, but without, only one was actually capable of a sharp exposure here. 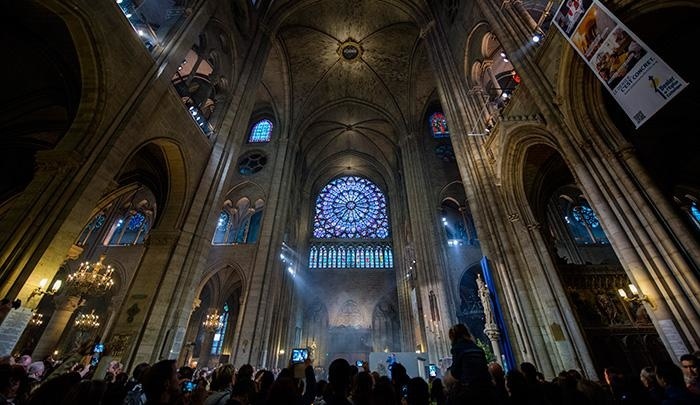 This next shot at Sainte Chappelle was different. I had just enough time to get my sticks on the ground and take a few exposures before being asked to put it away (the tripod ban in Europe is epidemic). With a tripod and a steady hand, you can shoot almost anything on medium format film, but limited to being handheld or in a crowd of people your DSLR is much a more versatile choice for many reasons, which should surprise no one. This is not a run and gun camera system your first time out with it. 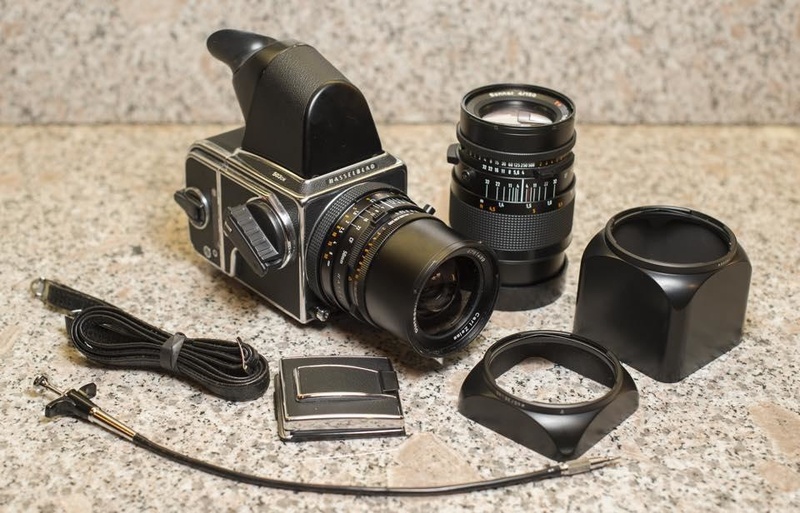 The Hasselblad leaf-shutter lens is where all the settings live, including a PC sync-cable out. This means I can use my existing cheapo Cowboy Studio radio triggers to fire my speedlights off-camera. I gave it a shot with this lovely Australian couple I met at the Eiffel Tower and found I needed to take test shots for exposure like normal and then for many more for lighting making this shot take 4x longer to set up than any other in Paris. Hasselblad 503cw, 80mm, ISO 160, 1 sec, f/??. Nikon SB700 in a reflective umbrella directly above camera at full power. When you're in bright sunlight this is a very intuitive camera system. Crank up your shutter to 1/500, meter your aperture from there and as long as your subject isn't out of focus, you're going to be impressed with the results. The dynamic range of this film is very impressive compared to digital and somehow so much closer to what your mind remembers actually seeing. The good folks at Camera West in Walnut Creek, CA taught me that a good rule of thumb is your shutter should never be longer than 1 over the lens’ focal length. So if you're using an 80mm lens you should try to keep your shutter speed faster than 1/80 unless you're doing it for effect. This helps keep your subjects from being blurry from camera shake and their own movement. So when you'd normally crank your ISO up in the dark on your DSLR, medium format shooters are taught to open their aperture instead, not lengthen their shutter speed. 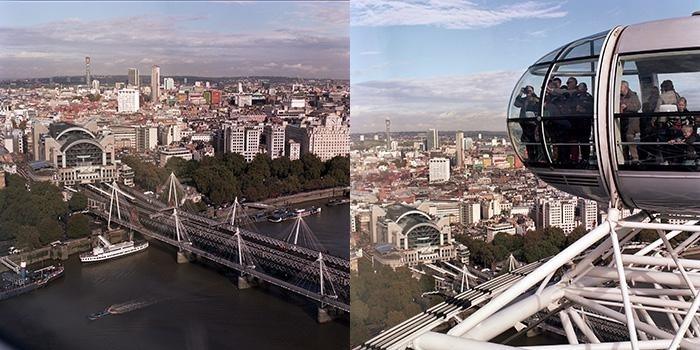 Here are some handheld exposures from The London Eye. ISO 160, 1/500, f/11. The A12 back has two places for film spools, one on top and one on bottom. The new roll goes on the bottom, and you’ll take the empty spool from your last roll and put it on top. The exposure you’re working on will sit on the black surface between the rolls, and as you shoot the cranking motion will transfer your roll one frame at a time from the spool it comes on to the one you recently finished, leaving another empty for your next roll. Rinse and repeat. The most common mistake I made when shooting medium format film was that I forgot to match the ISO between the D800 and the Hasselblad when test shooting. Now, for this portrait I wasn't sure if my subject was a murderer or a stunt man, but he was wearing massive skull rings and I thought that if I wasted any of his time he might tear my face off and take it with him. So in my haste, I overlooked the D800's ISO still set to 100. I took my test shot and liked my initial exposure of f/2.8 at 1/125 so I matched it on the Hasselblad. 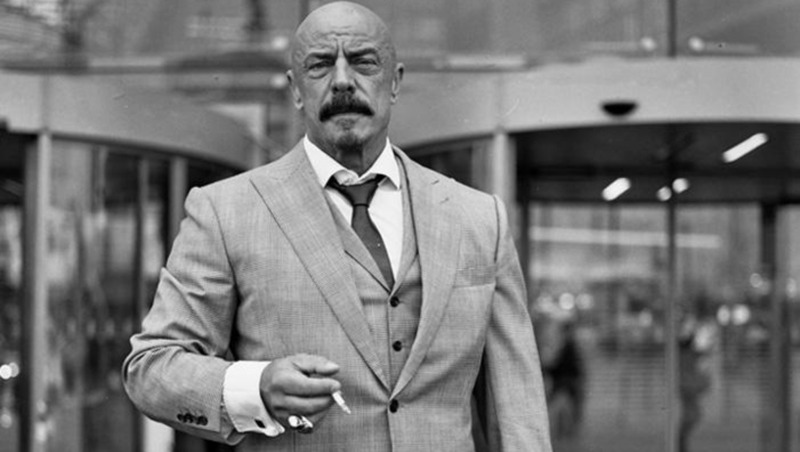 I took my shots, found out he is indeed a German stunt man named Frank, and I hurried back inside only to go through my settings again in my head and realized what I'd done. So I went back out with my D800 to get the right test exposure without Frank to see whether I just botched his portrait. Turns out, you can err a few stops in either direction and the film with its massive dynamic range can recover more than you'd expect. In this case, it seems it was a happy accident because this is one of my favorite exposures. As DSLR shooters, we get used to taking hundreds of photos, cherry picking the best few, retouching them until they’re unrecognizable, and somehow that’s an accurate representation of our photographic skill. I spent 32 days shooting in 8 countries. I took only 48 photos with this camera system (I didn’t get a lot of free time). The suspense that builds from that kind of delayed gratification ensures that when you get your prints back, you will feel heavily invested in their success. The ones that didn’t come out will disappoint you, but the ones that come out beautifully will give you butterflies like the first time you saw yourself truly represented in your photo. This camera system is as much about the journey as it is the destination and it creates a connection to the result that feels so different than anything I’ve experienced in the DSLR world. That’s why I bought my own the day after I returned my rental. I never thought my first Hasselblad would shoot film. Hasselblad 503cw, Carl Zeiss 50mm f/4, 150mm f/4. I think it's great that you have experimented and found something new, interesting, and unique to keep you going. I miss my medium format sometimes, particularly the waist level viewfinder. However, I would like to offer some good-natured clarification. Mainly, that you CAN change your ISO, you just have to keep multiple backs (it's the reason for the mag style system). When I was shooting Med Format all the time, I would keep not just different backs with different ISO film, but different backs with how the film was to be processed (i.e. 160 ISO, 160 ISO+ 1 stop, + 2 stops, etc.). I'd also like to note that some medium format cameras accept a metering prism viewfinder. My Mamiya 645 series film camera is modular. I can use a waist level finder (no metering) or a metered prism much like that of a 35mm SLR. Yeah, I had one of those for shooting at eye level, but I really miss the waist level finder. there is something about looking down into it ans seeing the image clearly on the ground glass. I'm not sure why, but my composition was always better with the waist level finder. You're right, and now I actually carry an A12 back and an NPC Polaroid back for the fun of it. When I rented it I didn't know enough about what I wanted to achieve to know to bring 2 A12 backs. I'll probably pick up another when I start using it in the studio more to have a roll of 160 and 400 going for different things. Thanks for reading! Yep. Was going to make the same comment. 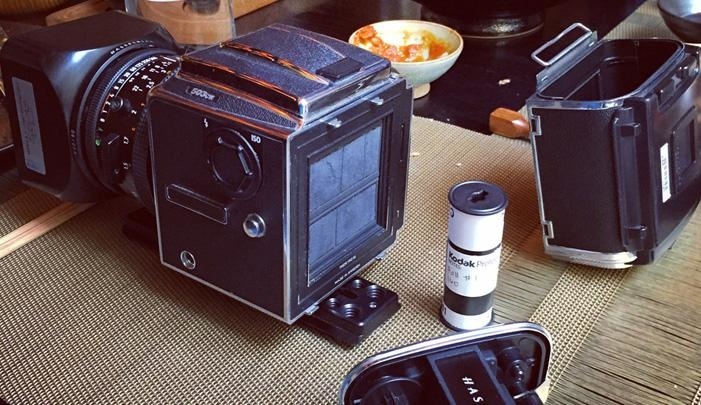 Any modular MF system will allow mid-roll film changing as long as you're willing to carry the extra backs. Admittedly it's no were near as convenient as on modern cameras, but you also don't have to spend time creating a "film look" in post so the two more than balance out. Hassy, Mamiya, Bronica, Kiev, etc., all have interchangeable backs. Bodies from Pentax are the noticeable departure here. You can't change mid-roll on the 645 or 67, though the 645 does have inserts to make changes a bit quicker when the roll is fully exposed. Rangefinder cams also require roll exhausting prior to changing. As other posters have commented, metered prisms are also available for most modular systems, even the SLR-like Pentax 67. Most feature only center weighted metering, but Matrix and spot are available in some bodies. I agree that you will likely mess up and most likely feel a certain special when viewing them. If you get a speed grip with the body (if offered) handheld shooting is also much better and SLR like. 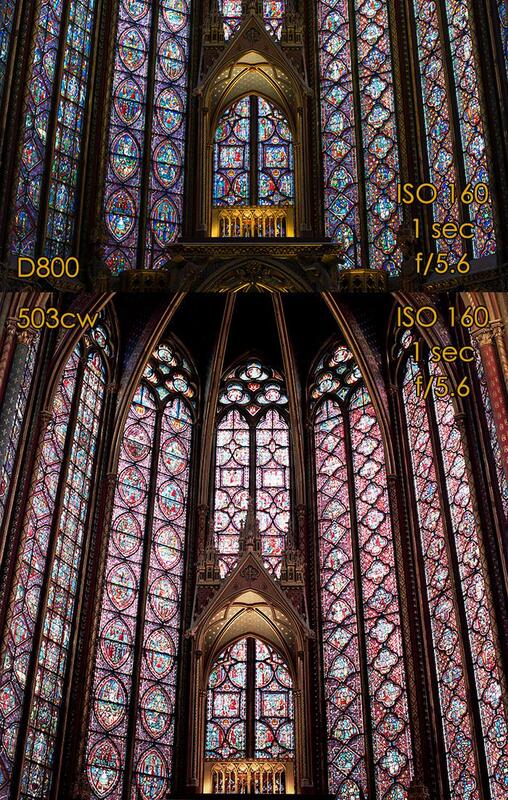 Mirror slap on most wont be a huge issue at modest shutter speeds, but for those who've grown accustomed to stabilized lenses or sensor shift technology may want to crosscheck things a second time before firing. 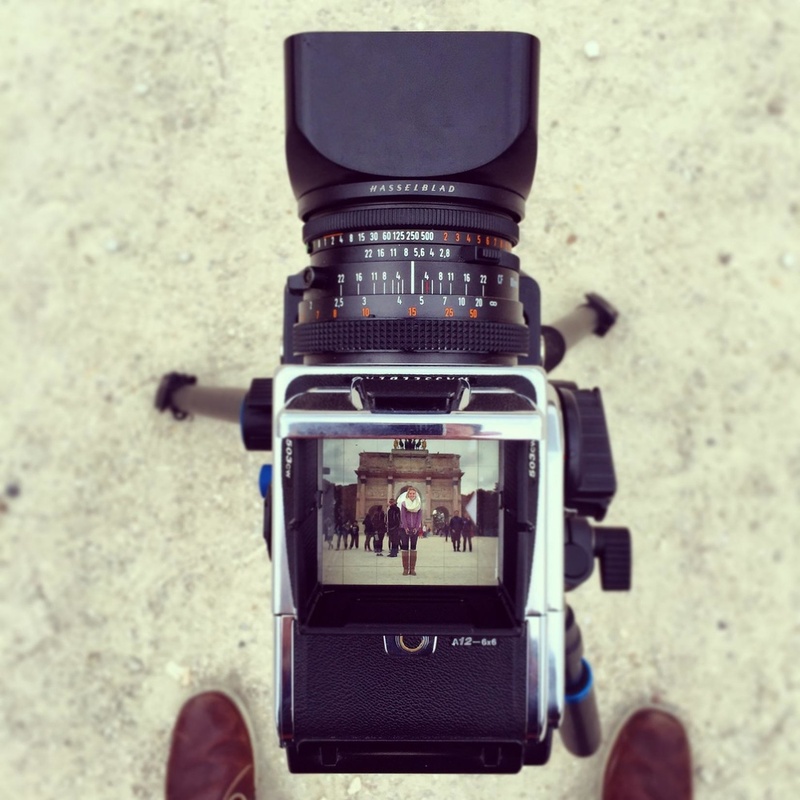 With the Hasselblad you can change the viewfinder from a non-metered to metered. The 503cw can use the PME-51 or the PME-5. Most "modern" medium format systems ie., Contax 645 or the Hasselblad H systems not only have metering (center or spot) but autofocus too. 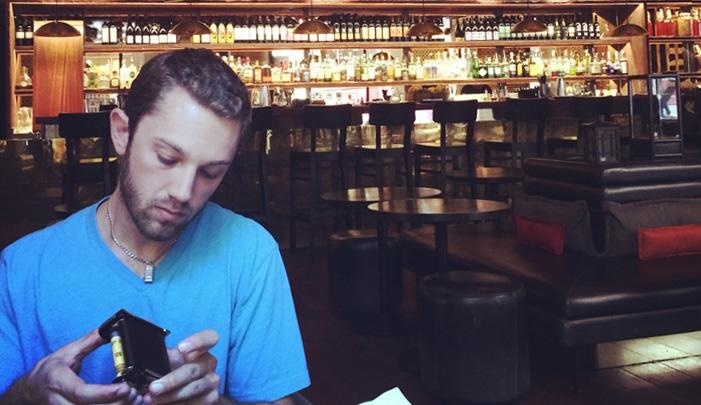 Nice article - since I am both a film and digital user - appreciate seeing folks returning to film. Thanks for this info! I'm not super happy with my non-metered one for other reasons (and I wish my 45 degree viewfinder had a cold shoe) so maybe I'll grab one of those. It seems like there are a ton of ways to upgrade this camera and really make it yours. Good point! I don't know what I'd do! I've only been through 5 rolls with it now, but it hasn't jammed on me once! Can you tell us the secret? A very well written introduction about MF film which certainly will motivate others to try film out as well. Thanks for sharing. The good thing with medium format film is that you can try different systems without too much risk until you find what you like, as you can sell almost for the price you bought it. Thank you for the compliment. I hope to be bringing the medium format film perspective frequently. It's really been forcing me to get things right in camera in a way I appreciate. I enjoyed the article. I'm a newbie when it comes to shooting a DSLR with a year's experience of using a DSLR, but I've been using 35mm film since 1980. I do want to get into MF photography with the Mamiya 645 and RZ67 systems; 6x4.5 has a longer reach than 6x7 similar to APS-C and full frame while 6x7 provides a larger negative. Yup! Lesson #1 is definitely a factor. It is even more a limiting factor with 35mm film cameras; not so much with medium format cameras with interchangeable film backs. I would have loved the luxury of being able to change ISO midstream, but I was locked in. I had to "dump" ISO 100 film taking photos in a lit parking lot so I could load ISO 400 film pushed to 1600. Lesson #7: Loading film in my Canon A-1 is different than my Canon F-1N. The takeup spool on the A-1 rotates counter-clockwise whereas the F-1N rotates clockwise. I had to change rolls while photographing the Air Force Thunderbirds; fortunately, it happened during a lull in their performance while they were regrouping for their next pass. Lesson #8: Film does have great latitude. I finished a roll of Kodak TMAX 100 and loaded Kodak BW400CN, forgetting to set the ISO to 400 while boating in broad sunlight. The overexposed negatives turned out okay. I would say take a few extra gigs this month and pull the trigger. You won't regret it! Now why would you want to bring a Film Camera to a professional assignment in 2014? I don't really get your reasons behind your decision. Bringing a Hasselblad to this big Job all over Europe is the right decision. But why would you bother with film? 5 or 10 years ago people said that digital just doesn't match film. But in 2014, I honestly don't think film brings any advantages other then nostalgic feelings. It was not a professional decision. I knew I'd be spending literally every day operating my DSLR and FS700 professionally. I didn't want to continue to do so in my free time. I wanted to teach myself something I'd never tried before that wouldn't break the bank. I wanted inspiration to walk further to get the shot I really wanted and to compose the image so perfectly the first time I'd only have to take it once. This was definitely a personal choice, not a professional one. And if you read the last two paragraphs here I tried to explain why it was the right one for me, which may not mean it's the right one for every professional. On a different note I don't think "why bother with ______" is ever the right attitude. There are so many talented artists in this medium using the same tools in myriad ways. My favorite photographer right now shoots medium format film exclusively on a much cheaper camera than this, and he only uses one lens. I got the impression from the article that you got the MF BECAUSE of the assignment. "When my client Synergy Corporate Housing asked me to continue that mission with all of their international properties in 10 major cities across 8 European countries, the first thing I thought when I saw the 32-day itinerary was, "bring a Hasselblad."" I think what you meant was something like - "The first thing I thought was I'm going to be bored shooting work all day, I bet it would be fun to try a MF film camera during my free time"
Great article though. I've been looking at Lviv '88s for a while now. My wife is from Lviv and thought it would be nice to have a working one. I suppose you're right, I could've simply added "too" to the end of that sentence and it would've cleared up confusion. I also mention I make my living shooting video with DSLRs and that Synergy sent me to Europe to "continue that mission." "Bringing your DSLR with you when you shoot medium format film not only offers you an accurate light meter, but shows your subject's focus distance, a rough composition and a test exposure too" - not sure the reasoning behind this, as you are looking through the lens on the Hassy, so seeing the exact composition you are going to get; the focus distance scale is on the lens - in meters and ft, as well as the depth of field scale correlated to fstops. You also have a depth of field preview button on the lens. The only thing missing here is the light meter, and it seems a lot of overkill to use a DSLR as a light meter. I travelled all over Italy with a 500CM, 80mm lens and used sunny 16 exposure for all my readings. Otherwise, I would say to buy a light meter. While you're certainly right, this article is geared toward folks using a DSLR primarily who may be unfamiliar with almost everything you've said from the Sunny 16 rule to the DOF preview button (which I almost never found helpful). I imagine most people reading are like I was, never even having held a medium format film camera before. If this article was called "How to drop your DSLR entirely and pick up a v-system camera," your suggestions would probably fit better. I'm trying to show that it's not so different and that you can explore medium format film in DSLR terms folks are already familiar with. A DSLR is a good way to eliminate some of the guess work medium format film cameras don't help with like focus distance and shutter speed. You may think it's overkill because you have familiarity with these systems, but I brought both half way across the world and I didn't find it overkill at all. In fact, it was the reason I was able to write this article comparing images across both mediums. This is just how I decided to teach myself this camera system, to put it in terms I felt more familiar with. I certainly don't suggest everyone do as I did. I'm hardly an expert after 5 rolls of 120 film, I just wanted to share my experience and the tips that I found useful. I love my Bronica SQAM camera, it was dream to use and gave great results for many years. Good article. I just picked up a mint Mamiya RB67 Pro S off of eBay and I am having a great time learning all about it. It's fun to switch things up and lets me learn something new. Can't wait to see my results from the first roll. Bro, dont act like you know about film and try to compare it to digital. It takes time and the knowledge to hone the skill and also understand which gear works for you. Keep to your digital and let the people who shoot film do what they do best. Crank your ISO to 500000 or whatevers. Go buy the next D900/5D mark whatevers. Just because you went out and rented a film camera doesnt justify you making a comparison. Stick with digital man. Couldn't disagree with everything you've said here more. I never claim to have any type of superior knowledge about this new format to me, I make clear that I knew zero about it and only know a modicum more than that now. I'll continue to shoot both with a smile on. And hopefully people will continue to read about it. Hopefully even you. Bro. If you knew nothing about it, and barely know any more now, why would you write a guide to shooting medium format film? It's clear you don't have any experience and don't know the medium. Why not learn it before you try to teach others so you don't pass along false information and make yourself look dumb? Hopefully people don't continue to read about it and instead get information from someone who knows what they are doing. It became pretty obvious reading the article that the author has no idea what he is talking about. Much of the information is just plain false. Plenty of medium format cameras have meters for example. 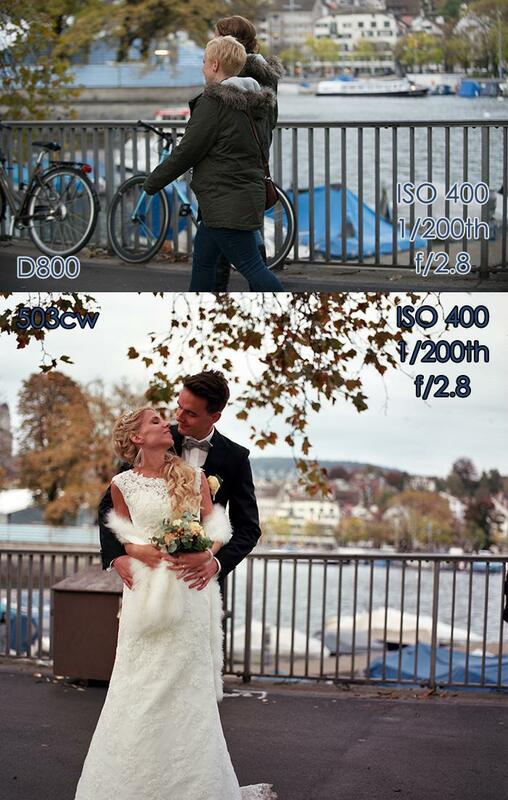 And how exactly did he shoot an image at 1/200 of a second on a system that only offers whole stop increments? And that Hassy has a leaf shutter, which makes it very handholdable in far less than "bright sunlight". Other parts are just insulting. "Loading film is easy: You can do it." Seriously? It's nice to see in the comments that the author admits he is clueless and has only shot 5 rolls of film. It's disappointing that f-stoppers would allow such a noob to write a "guide to medium format film" after having shot 5 rolls. Hard to take this site very seriously if thats the only qualification necessary. It is a nice article but also weird for me. I started by shooting film first then switched to digital. I started learning how to shoot manually. In my first semester of High School we were shooting 35mm then medium format cameras by second semester it was Medium format and Large format, by the third semester we were doing the zone system. Of course my high school teacher was friends with John Sexton. Here is a very simple thing to remember for shooting film. B&W film has about 3-3.5 f/stops of latitude. Color Print Film has about 1-1.5 f/stops of latitude. Slide film about 1/2 f-stop of latitude. Also the lab that you process at can effect your exposure depending on how well they maintain their chem. So a good pro lab is need for consistent results. I ran the B&W then color lab when I was shooting for Pulitzer INC. We were using Noritzu film processors with Kodak C41, personally I always liked Fujicolor at the time. Noritzu film processors were cool because you could push or pull your film and set up custom development times. Now as far B&W give me Tri-X and HC110 developer and i was happy camper. I thought this was a nice article and true that some film cameras have meters others do not. I shoot with a Mamiya c330 and a Minolta SRT-101. The Minolta has a meter that stopped working long ago. I have been shooting with it for over 30 years. Just to note I also shoot with a Canon 5d Mark II. But that's another story. I use an app on my iPhone called Light Meter for determining my exposure when shooting film. It works great and I do not need to take a DLSR with me. I also have a light meter in my bag but rarely use it except when checking flash exposure. You are absolutely right, film makes you slow down. I tell my students it is photography in its purity and makes you think. If you want the same experience with digital tape over your display on the back of the camera, shoot full manual at a set ISO such as ISO 160 and do not look at your images off your card for a week. So I do have a question. Comparing digital to film what is your scan resolution? The way that I fell about film is it is not better or worse than digital, only different. It produces a higher contrast image I think than digital. But that is my opinion. Think about this. 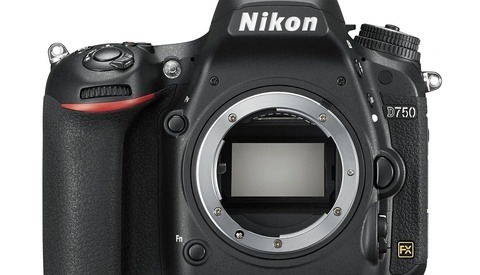 Many photographers make a big deal about full frame cameras. And they are expensive. However, if you shoot 35mm you are shooting full frame right? And low noise only grain to deal with. And if you shoot medium format you are shooting equivalent to cameras that run many thousands of dollars. For example the RED or Hasselblad are 2 1/4 x 2 1/4 image sensors. So if you want to shoot this size image and you do not happen to have an extra $25,000 hanging around pick up a film camera for under a grand. Thanks for sharing your experience in film. My scans from Keeble & Shuchat in Palo Alto gave me 2000px square uncompressed TIF files. I've read that with a drum scanner you can get digital files just as big as my D800 from a sheer pixel/density perspective. I don't have a drum scanner and probably won't be interested in scanning mine that way as long as I'm shooting digital alongside. I just took my Hasselblad alongside my D800 for the first time on a print shoot on Tuesday and I found that at the end of the day I'm going to be using my digital files in post. The film seems to act more as a keepsake for me and the client. I left a polaroid with the model and she seemed pleased with it.